I wrote about the dinner at PH2 during Art Basel weekend with chefs Kurtis Jantz and Chad Galiano over here. It wasn't a Cobaya dinner but several guinea pigs came out, with discounted rates from PH2 for Cobayas. The upcoming Cobaya dinner on December 17 is on schedule and we have a full house. Thanks to everyone for your interest and apologies to those for whom there weren't enough seats. Working on a "lottery" system for at least some of the seats for the next event so that they're not all gone in two hours like the past couple dinners. If you're signed up for it, you'll be getting some details soon. Next dinner after this one will likely be mid to late January. I've posted earlier on the Art/Dining series of events at PH2 coming up on Art Basel weekend. There are still some tickets remaining for the Friday and Saturday dinners and the Sunday brunch, and the PH2 folks are extending a "Black Friday" discount to Cobaya members: $100 off the dinner tix (for a net price of $100) and $25 off the Sunday brunch (for a net price of $50). For more information and the discounts codes, check this Cobaya Google Group thread. Edited to add: I just came across this feature in the Miami Herald on Stephen Gamson, the "artist in residence" for the Friday night dinner. We had a nice turnout of "Very Important Pigs" for an early tasting of the P.I.G. (Pork Is Good) fest by Chef Jeremiah Bullfrog this past Sunday at Harvey's By The Bay, east of Biscayne Boulevard off 64th Street. 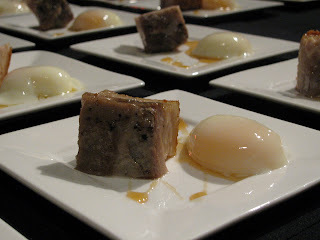 There's already a couple good recaps up from Tinkering With Dinner and Jean-Marc (nice headshot of the pig there). I'll be getting mine up soon Mine are now up at Food For Thought. There seemed to be plenty of people taking pictures and notes, so if you've posted something please let me know and I'm happy to link to it. - the "VIP" Passes for P.I.G. [Pork Is Good] pigfest with Chef Jeremiah Bullfrog are sold out. All comers are still welcome after 3pm for a la carte pig and partying at Harvey's By the Bay at 6445 NE 7th Ave. (off 64th Street east of Biscayne Boulevard) this Sunday, November 22. - Tickets are still available from PH2 for their series of Art/Dining events during Art Basel weekend (click on the link to purchase). There are some interesting insights on the creative process of pairing food to art from one of the chefs here on his blog. The Friday dinner is a good chance to experience one of the "Paradigm" dinners from Chefs Kurtis Jantz and Chad Galiano, while Saturday features Chef Alberto Cabrera, and Chef Jeremiah will be putting on a Sunday brunch. Cobaya members get a $50 discount on all but the Sunday brunch tickets. More information available at the Cobaya message board. - Hold the date: December 17 for the next Cobaya dinner. More info to follow. Our hosts for the last Cobaya dinner, The Factory Interactive, have organized a series of art-meets-food events over Art Basel weekend. The Thursday event is already fulled booked. Friday night features chefs Kurtis Jantz and Chad Galiano, the chefs responsible for the Paradigm dinners, and the art of Stephen Gamson. Saturday night features chef Alberto Cabrera and artist Alejandro Mendoza. The festivities will finish with a Sunday brunch by chef Jeremiah Bullfrog, who cooked up the most recent Cobaya dinner, with art from Claudio Picasso (I'd swear I've heard both those names before). For more information on the PH2 Art | Dining series, go to their site. Fellow guinea pigs can take advantage of discounted tickets for the Friday and Saturday (before they sell out! ); check the Cobaya group message board for details. Want to play some "PIG"? As noted yesterday, PIG - [Pork Is Good], an ode to the porcine by Chef Jeremiah Bullfog, will be happening Sunday November 22 at Harvey's By the Bay (American Legion Hall), 6445 NE 7th Ave. (off 64th Street east of Biscayne Boulevard). Chef is going to be doing 4-5 "Iron Chef" style pork dishes, plus roasting several whole pigs in a caja china. You can get "VIP" ("Very Important Pig") preview tickets here for $35 which will get early admission at 2pm, a sampling of each of the dishes, plus carvings from the first pig (and then more until it runs out). Then after 3pm, anyone who comes can have what they like, with affordable "a la carte" prices and combo deals for multiple items. As many as want to come are welcome, there will be food until it runs out, good music, and the Harvey's bar will be open. 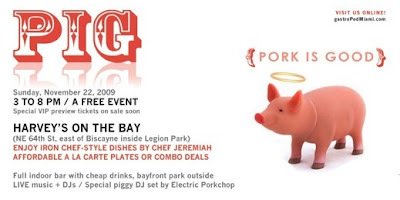 For those who missed the second-night Chef Jeremiah pig-fest, take note: PIG - [Pork Is Good], an ode to the porcine, will be happening Sunday November 22 at Harvey's By the Bay (American Legion Hall), 6445 NE 7th Ave. (off 64th Street east of Biscayne Boulevard). More information to follow, including VIP (Very Important Pig) preview tix. The goal here is a very simple one - to get talented chefs to cook great, interesting, creative meals for an audience of adventurous, open-minded diners. That may happen inside a restaurant, it may happen outside of one. It may be a multi-course tasting menu, it may be a family-style whole hog dinner (here's hoping). For those who question the "underground" street cred of this mission, those questions are perfectly legitimate. My answer is, "I don't care." 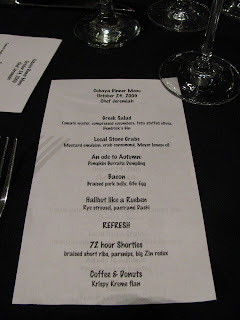 We're not limiting ourselves to meals cooked in abandoned warehouses in secret locations disclosed the day before the dinner; we're also not limiting ourselves to white tablecloths and silverware changed between every course. We're very open-minded that way: all that matters is if the food is good, and we think there's enough similar-minded folks to make that game plan sustainable. Every invitation comes with a disclaimer: there is no "menu". There are no choices. You'll be eating what the chef chooses to make for the night. If you have food related allergies, strict dietary requirements, religious restrictions; are salt sensitive, vegetarian, pescatarian, or vegan; don't like your meat cooked medium rare, or are pregnant: this meal is probably not for you. Do not expect white-glove service. Don't ask for your sauce on the side. Just come and enjoy. 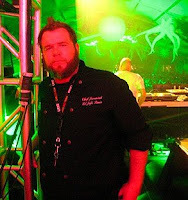 Food For Thought and The Chowfather are working on making an "underground dinner club" thing happen here in Miami. Given that it's Miami, "underground" is not so easy to do (we're at sea level and all), but the idea we were both kicking around was to assemble a group of adventurous diners willing to serve as guinea pigs for local chefs looking to try out something new or different. A first event is already being planned for August 4, a few spots will still be available. More info to follow soon. If interested, start by joining the Miami Chowdown Google Group and you'll soon find your way.